How does a vicar differ from a rector? Is a marquis a lord? Where are the Home Counties? Is someone who is dead chuffed happy or angry? Americans reading British literature, come upon such unfamiliar terms and generally have to rely on contextual clues. For the legions of readers of Dickens and Trollope, of Agatha Christie, John LeCarre, and P.D. James, of Muriel Spark and Iris Murdoch, of Noel Coward and Tom Stoppard--to name a few--as well as viewers of British film and television imports, this helpful and entertaining guide defines the kinds of things that British authors thought needed no explanation. Part dictionary, part guidebook, part almanac, part gazetter, part history, part sociology, this lexicon has no specialty, for it deals with British culture in general. 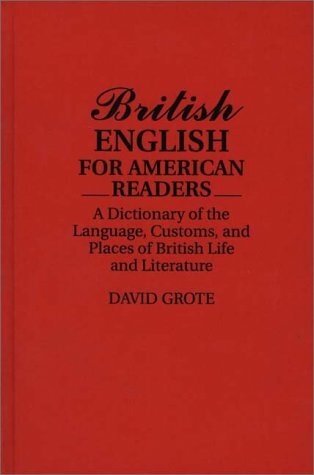 David Grote's guiding principle was to select terminology with the potential to confuse readers who know only American English. Consequently, the volume is organized as a dictionary, with entries for concepts, items, and names that might create confusion. Entries are arranged alphabetically, from ten basic categories: (1) titles, ranks, and honours; (2) widely used words not part of the typical American vocabulary; (3) words used differently in America and Britain; (4) customs, terminology, and activities of daily life not shared by Americans; (5) governmental organizations; (6) political and legal customs and methods; (7) communities, and places often used in literary works; (8) foods and common commercial products; (9) common animals and plants not found in the same form in America; and (10) basic social practices that differ considerably from modern American practice. Ideally kept on hand for ready referral when immersed in fictional Britain, this dictionary will make for many enjoyable hours of random or systematic browsing. A true companion to British literature, its concern is not authors and literary history, but the slang, bureaucracy, stereotypes of places, food and products used in daily life, social organization, and hundreds of such homespun items.